Annatto (Mexican/Spanish - Achiote; Hindi - Sindhuri; Malay - Jarak belanda; Filipino - Atsuete), one of the world’s most important natural food colorant that yields yellow to red tint, is derived from the seeds of the tropical tree “Bixa orellana Linn”. Such tree is also known as the “lipstick plant” as its seed extract is also popularly used in some countries as cosmetics and body paint. The tree can grow 4 to 6 meters with pointed heart-shaped leaves. It has a white to pinkish flower and a brownish red, rounded to oval-shaped, spiny fruit. The fruit of annatto when matured splits into two to reveal its seeds. The seeds are numerous tiny kernel-like particles with red to deep orange pulp outer covering. These are usually powderized or steeped in oil, and the resulting extract is used as dye or food coloring. The seed has two carotenoid substances called bixin and norbixin that are responsible for its distinct color. The substances work in the same way with beta-carotene, also a carotenoid chemical compound that produces the orange pigment in carrot. The planting of annatto trees is believed to have originated in the Caribbean and South America, and it is now widely cultivated in tropical and subtropical regions in many parts of America, Asia and Africa. Currently, Brazil and Peru are the major producers and suppliers of annatto products in the world. 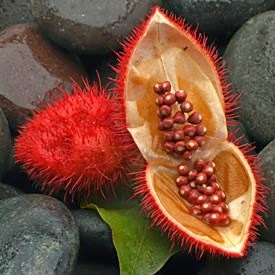 Annatto is a component in many dishes, soups and stews of Latin and South American cuisines. It is a well-known coloring agent in dairy products like cheese, butter and margarine, as well as in other food products like seasonings, processed meats, smoked fish, baked goods, rice and beverages. Its scent can be described as mildly peppery and the taste as slightly nutty, earthy and delicately sweet. It is oftentimes referred to as the “poor man’s saffron” because it can produce the similar yellow to orange-ish color of saffron at a cheaper price. The flavor is not as pungent or spicy though. Atsuete was introduced in the Philippines by the Spanish settlers when they occupy the islands in the 1500s. 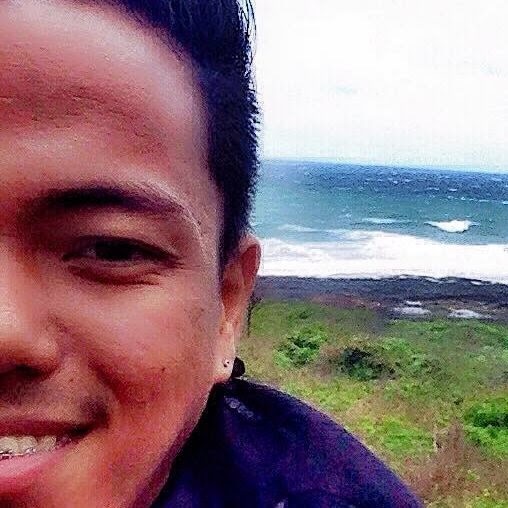 Since then, it became a universal natural coloring and flavoring additives to a number of Filipino dishes. It has become a very important component of pancit palabok (garnished rice noodles), kare-kare (stewed oxtail and mixed veggies in peanut sauce), adobong pula (red adobo) and chicken inasal (chicken barbecue). Annatto is not a common grocery item in most European and American supermarkets. It is frequently available in native stores that specialize in Asian, Caribbean or Mexican spices and usually labeled according to their local names. They come in whole seeds, powder or oils. You can make your own homemade annatto oil extract using the dried seeds. Below is the easy step-by-step technique. In a small saucepan, combine the atsuete seeds and oil on stovetop over low to medium heat. Keep the heat to medium until the oil is shimmering hot. When the oil begins to bubble or boil around the atsuete seeds, turn off the stove. Make sure not to overcook or burn the seeds or it will create a bitter taste. Allow the seeds to sit in the oil for 3 to 5 minutes. Filter the cooked annatto seeds with a strainer and transfer the oil in a separate container. Discard the used seeds. If using water instead of oil, just follow the same steps. Use the annatto extract as food additive or ingredients to any dish that calls for it. The extract of the seed steeped in oil is more potent than in water. Allow the oil extract to cool down and place in a sealed container if you intend to stock it for future use. The annatto oil can be stored for one week in an airtight container at room temperature and for several months inside the refrigerator. It is more advisable to make extract in small batches as the flavor and color would easily deteriorate.